Located in southern Tunisia on the edge of the Grand Erg Oriental, Ksar Ghilane is a small oasis and a natural gateway to one of the Sahara Desert's most impressive dune seas. This is the Sahara of your dreams, where extraordinary, biscuit-colored sand dunes stretch as far as the eye can see. Visitors flock to Ksar Ghilane to explore the desert on camel or horseback, or to spend the night in one of the oasis' Bedouin camps. A natural hot spring provides a place to wash away the sand at the end of the day and the Roman fort of Tisavar is located nearby. As soon as you arrive at Ksar Ghilane you'll be greeted by mysterious turbaned men on horseback encouraging you to rent their fine horses for a few hours of dune exploration. Camels are also on offer of course and are generally cheaper to rent. Most people arrive with a 4x4 vehicle and there are some tracks in the dunes for practicing your off-road skills. You can also rent dune buggies or ATVs. Guided tours take you through the desert to the ruins of the Roman fort of Tisavar, which was repurposed by Berber tribes in the 16th century. If you have the time, plan to stay overnight at Ksar Ghilane. This will give you the opportunity for a sunset ride into the desert (whether on horseback, camelback or ATV). As the sun starts to sink below the horizon, the dunes are transformed from orange to gold, pink and red and the stars start to appear in a sky unspoiled by light pollution. In between adventures, take a dip in the Ksar Ghilane oasis. Nestled amidst a grove of date palms and fed by a thermal spring, it's warm enough to be utterly relaxing yet still offers repsite from the desert heat. Most people visit Ksar Ghilane for a night or two and venture out into the dunes on a single sunrise or sunset tour. However, it's also possible to visit the oasis as part of a much longer desert adventure. Siroko Travel offers multi-day treks on camel or horseback including an 8-day itinerary from Douz to Ksar Ghilane. Along the way you'll stay in open bivouacs or Bedouin tents and cook over campfires. You'll need to be fit, because while your camel will carry all your equipment, you'll spend most of the journey on foot. Ksar Ghilane is also the final stop on Adventure Treks' two-week trek from El Sabria south to the Algerian border. If you like the idea of spending a night in the desert but don't have time for a multi-day trek, an alternative option is to book an overnight tour to a nearby Bedouin camp. 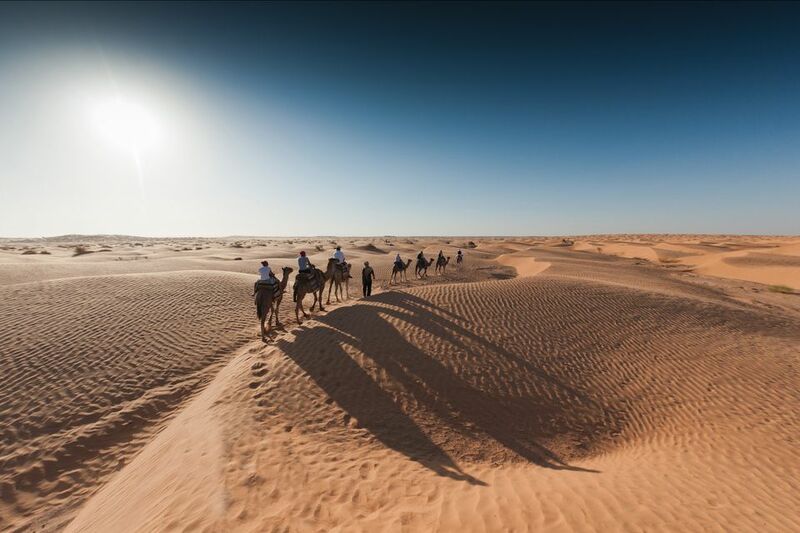 Here you can watch desert nomads preparing their traditional meals, spend hours stargazing and keep an eye out for the strange nocturnal animals that live in the dunes. There are several accommodation options in Ksar Ghilane. Some, like Campement le Ksar and Campement Paradis, are basic tented camps with a restaurant, lounge area and a bar that serves alcohol. The camps are powered by generators and power is typically shut off from 11:00pm to 7:00am. Résidence La Source offers private hotel rooms with ensuite bathrooms in addition to backpacker-friendly dormitories with access to a shared shower block. All-inclusive room rates include all meals and a camel, horse or quad bike tour. Camp Yadis Ksar Guilane is the oasis' most comfortable option. Its luxury linen tents are made in the traditional Bedouin style and are arranged around a private free-form swimming pool. Each one offers air-conditioning, heating and a private bathroom. The hotel also has a traditional hammam and a restaurant that serves authentic Tunisian and Mediterranean cuisine. Camel and jeep excursions can be arranged. Since there is no local bus or louage (shared taxi) to Ksar Ghilane, the only way to get there is on an organized tour or in your own vehicle. The oasis is located approximately 145 kilometers from Douz and takes just over two hours to get to from there. Although the main road that connects the two is relatively good, once you reach the oasis the roads in between the camps are covered in deep sand. As such, if you plan on hiring a car and traveling there independently, make sure you get a 4x4. This article was updated and re-written in part by Jessica Macdonald on February 13 2019.